Even something as commonplace as building a house is imbued with symbolic customs in Bouyei culture. First, a specialist will be invited to select an auspicious place to build, ideally a location beside a mountain and a river. However, the house should not only back onto mountains but should also face them, and the shape of these mountains is particularly important. The mountains behind the house should look like guarding lions, defensive dragons, or nobleman riding on horses, while the mountains in front ideally must look like dragons fighting over jewellery, dragons playing with pearls, a thousand horses returning to their stables, or the God of Longevity rising up. Luckily, the area where the Bouyei live is surrounded by strangely shaped Karst mountains so, even if your chosen mountain doesn’t exactly look like two dragons arguing over a silver necklace, you can just say it does! A propitious day will then be chosen to erect the house and one month before this day a carpenter will prepare the house’s structure. When the day finally comes, a sacrifice will be made to Lu Ban, the God of Carpentry. The main beam, which is decorated with red silk, will then be carried from the father-in-law’s house to the building site and accompanied by an orchestra, as well as a team of acrobats. In other words, this beam gets a grander entrance than most celebrities! Once the beam has been fixed, a singing and dancing ceremony will take place, followed by a feast. After the festivities, a shrine dedicated to the family’s ancestors and the Kitchen God will be positioned in a central part of the new house. 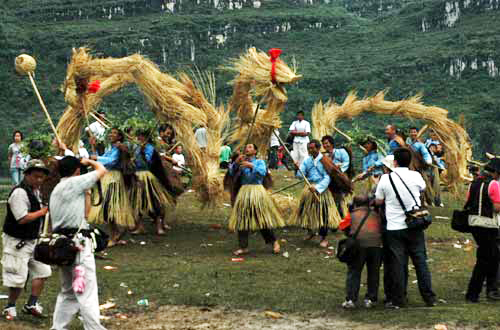 In some Bouyei communities, an annual ceremony known as “inviting the dragon” is still practised. 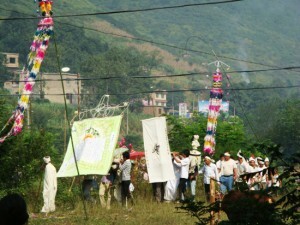 Before the ceremony, villagers will gather offerings for the dragon in the form of food and wine. Then a local priest, known as a Bumo, will sit down and recite the appropriate prayers. Once he has finished, the village chief will carry two eggs and bury them at the foot of two posts. In Bouyei culture, the yolk of an egg symbolises gold and the white signifies silver, so overall the egg represents wealth. Thus, while the eggs are being buried, the villagers all sing: “Keep the gold and silver that we bury, and don’t let anyone take it”. It may not be the most spectacular gift in the world, but at least the dragon can have a decent omelette! Funerals in Bouyei communities are notoriously complicated procedures. Once a person has died, their relatives bath them, comb their hair, and dress them. The corpse is then placed on a bed, where friends and relatives can pay their last respects. 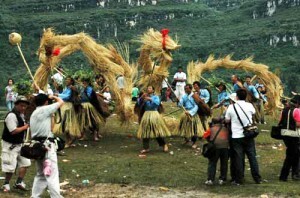 The funeral begins with a priest performing a ritual where he asks the dragon to help the deceased’s soul on its way to the underworld. Then a bull is slaughtered and its meat is shared by everyone except relatives of the deceased. The Bouyei believe that this bull will help the soul of the deceased plough fields in the underworld, although we dread to think what kinds of crops they grow down there! Finally the priest will conduct an “opening the way” ceremony, where he indicates the passage that the soul must follow in order to reach its ancestors. The priest will then lead the funeral procession to the grave site accompanied by the sound of horns and drums. Paper money and incense is burned in honour of the deceased before they are buried and the burial is punctuated by the sound of a bronze drum, which will be beaten three times a day after the burial. The Bouyei believe that this will help carry the soul to its ancestors, as the belief that the bronze drum can communicate with the underworld is widely spread throughout China and Asia. After three years, the person’s remains are disinterred and the bones are placed in a clay urn for reburial. There are also a number of taboos in Bouyei culture. For example, the first time thunder is heard each year, it is forbidden to do any type of farm work for several days; a woman must never return to her parents’ home to give birth; and the corpse of anyone who has died outside must not be carried back into their home.